Last time we looked at the hockey team, they had just beaten the fifth-ranked Michigan State Spartans to a pulp, making up for their own three-goal loss the night before. After that, the team rattled off seven straight wins, including another victory over the Spartans, before bookending November with another loss, this time to top-ranked Minnesota. There's a lot of good stuff to see from this November. The only two losses we took were to top-5 teams, while beating a #5 team and a #6 team. Granted, both of those ranked teams were MSU, but they've had our number for a while. I'm really happy about the 2-1 win from a couple weeks ago. That's the kind of score Sauer hadn't given us until then. If we'd scored less than three, we'd always lost. Almost as nice is seeing the Wolverines take care of business when it comes to teams they should beat. We always seem to give one away up in Big Rapids to an overmatched Ferris State, but we came home on the right side of a 3-2 score this year and with the sweep. Earning a split (aka "Not getting swept") in the College Hockey Showcase is another thing to be proud of. Wisconsin had them down 3-2 going into the third, but Rohlfs and Cogliano scored and got the victory. Wiconsin's been on a skid as of late, but playing at Anchorage and against Denver and Minnesota in successive weekends will do that to you, so this was a good win to get in Madison. However, the team got absolutely de-pantsed by yet another Gopher squad. I mean obliterated, 8-2, with a 5-goal third period making it into a rout. That just makes you ill when you see it. We've got Western up this weekend, bottom-feeding again in the CCHA, so it's time to take care of a little business there. The Black Hole is a tough building to play in, but we should be able to managae. The weekend after, we have another home-and-home, this time against a Notre Dame team having a shockingly good season, floating just above the maize and blue in the polls. Their success looks to be built on not letting anyone into the net. In fact, it looks like there's not a lot of shooting going on, period, in their games. Are they running the trap? Anyway, I think I'm going to make it to the home half of that series, so I'd better find a way to get some student section tickets. No one has no way of knowing who is more deserving of being in the BCS Championship Game to face Ohio State. People may claim they know, people can make strong arguments for one team, or another, or a third, and you can listen to the evidence and say, "Yeah, that makes sense!" Then someone counterpoints it and you go "Wait, that makes sense too!" ...but USC's loss was not to SEC West winner Arkansas or Big XII North champion Nebraska, but to 8-4 Oregon State, who was smoked by Boise State 42-14. ...but Michigan nearly lost to Ball State at home and that three point loss to tOSU was not a close three point loss. ...but not for the fact that they scheduled Division I-AA Western Carolina, and UCF (which I believe is a show on Spike). I will not go after Florida for Florida State being down this year, that's a weak argument. "USC's tiebreaker is Arkansas and Nebraska versus our Vanderbilt, Central Michigan, and Ball State. They took on two above-average BCS teams. We took on the worst team in the SEC and two MAC teams, though one of them happens to be okay this year. Set aside the Michigan fandom and look at the big picture: if USC has this season and does not make the NC game, no one will ever schedule anyone again. It's time to take the bullet." "This may surprise some, but I am not in favor of a rematch between Michigan and Ohio State, largely because something would feel incomplete about Michigan getting to call itself national champion because it beat Ohio State last. Granted, it would be a neutral site game, but if the roles were reversed and Michigan had won by a small margin at home, I would be upset if tOSU got to claim the crystal ball because they won last." No one has no way of knowing who is more deserving of being in the BCS Championship Game to face Ohio State. They may think they know, they may believe they know, but they cannot actually know, because there is no way to make that case in a compelling fashion that is absolutely certain. "I'm sure this goes against everything you've been taught, but right and wrong do exist. Just because you don't know what the right answer is - maybe there's even no way you could know what the right answer is - doesn't make your answer right or even okay. It's much simpler than that. It's just plain wrong." I know what I am about to say is almost heresy for a Michigan fan, but here goes: I hate Notre Dame more than I do Ohio State. Don't get me wrong, I hate Ohio State, but I also pity them, because Buckeyes tend to make the news wires for some of the dumbest crimes possible (not that Michigan is saintly in this regard, but Maurice Clarett alone, I mean, come on...) But Notre Dame, there's so much to hate, and I think it simply comes down to this: No school is more arrogant than Notre Dame, not even Michigan. Michigan fans live with (and on some level, thrive on) the knowledge that most people non-maize and blue faithful in the state of Michigan hate them because Michigan folk are considered to be arrogant and that we look down our collective noses at the "hoi polloi." There's even a Facebook group called "I Go to Michigan and am therefore better than you." But Notre Dame has that holier than thou attitude, that top to bottom belief that they are the Chosen Team, that they are doing the Lord's work on the gridiron and how dare anyone question that! You couple that with the fact that in many years, Michigan season has been over in September because they couldn't beat the Irish and well, you start getting the South Bend-haterade in the big industrial sized bottles. So, let the boys go before Touchdown Jesus and pay the only appropriate respects that Division I's winningest college football program could pay, showing the Irish who's boss. After all, they'd be more than happy to do the same for Michigan, and one good turn deserves another. So now it's come to this: I am forced by circumstances to Cheer Cheer for Old Notre Dame this weekend. And it's kind of making me sick. I have spent an entire lifetime hating them, and now, I have to hope that they win by a small to medium margin in the L.A. Coliseum in order for Michigan to still have maybe a potential possible shot at playing in the National Championship game? This is going to be tough to swallow. And yet, "what we obtain too cheap, we esteem too lightly, 'tis dearness that gives all things value." They also have free video of the ceremonies linked at the site, but it requires registration. I only got to hear part of it in the car, but what struck me in what I heard is that while there is sadness in the passing and the void that will be there, there's also a joy that comes from remembering what we love, respect, admire about a person and about what we will miss because they will no longer be with us. The part of me that believes that laughter is as important in grief as tears appreciated that others feel that was as well. We will miss you Bo, but your spirit remains with us. *For our purposes, a riot is any large public disturbance that results in the destruction of property. The last Ann Arbor riot was following the 1989 NCAA basketball tournament victory, which resulted in broken windows and tear gas on South University. The last MSU riot was following their Final Four loss in 2005. The last Columbus riot was Saturday night. Car flipped == riot. I've been staring at the blinking cursor for 10 minutes now, trying to think of what to say, trying to think of how to say it. On the one hand, I want a rematch, because Michigan may be the second best team in the country. On the other hand, I don't want a rematch because Michigan had a shot at #1 and lost. On the one hand, I do think if you gave Michigan another shot at OSU, they could beat them, especially on a neutral field (and, as HSR correspondent Dave pointed out, maybe just an actual field. OSU should be ashamed of the condition that the Ohio Stadium field was in for that game. ), on the other hand, it would feel wrong, because Michigan would only be the national champion because they won last. We're sure you've hear by now. Bo Schembechler passed away today at the age of 77. The Free Press has the story here. We'll be back later with a proper tribute, but it's a sad day for the Michigan family. Glenn E. "Bo" Schembechler died today. In 1969, he took over a once-proud Michigan program that had been scuffling through its past decade and turned it back into a national powerhouse. In his 22 seasons at the helm, he compiled a 194-48-5 record, good for a 0.794 winning percentage and the most victories of any coach in Wolverine football history. He led his team to ten Rose Bowls, winning two of them. His 1971 Wolverines came within seconds of securing a national championship and his 1973 squad was unbeaten, going 10-0-1, but were kept out of the Rose Bowl by a vote of the Big Ten athletic directors. After retiring from coaching, Bo never really left the University of Michigan family. He kept a desk in Schembechler Hall, he showed up on air at Michigan football games. On the eve of this clash of titans, one of the all-time great Michigan men is with us no more. We offer our condolences to all in Michigan football whose lives he touched and to Bo's own family. 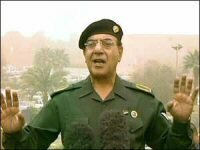 GDZ: I was only 8 years old when Bo stepped down, but I remember it and his last two Rose Bowls. I remember beating USC and then losing to them in successive years. Bo's voice has always been in my ears when it comes to Michigan football, listening to him provide commentary on those WJR broadcasts. The first book I remember my dad buying is BO. He's a legend. In 1999, I entered the University of Michigan and joined the marching band. During Band Week, we were loaded up morning, noon, and night with marching and music rehearsals. One evening, things went differently. Instead of Elbel Field, we went over to Michigan Stadium. It was the first time I'd ever been inside the Big House at night and I didn't know what to expect next. We were to have a speaker, introduced as a man who needed no introduction. It was Bo. The Man himself had come here to give us his time. I was in awe of him; I couldn't believe he was really there. Much of his talk was lost to me because of this, but I remember him talking about what makes a Michigan man, about what Michigan stands for, about perseverance ("Those Who Stay Will Be Champions"), and about preparation. I was proud to play my own small part in all of this and proud that Bo considered us important enough to address us. The next weekend, the football team won a comeback victory over Notre Dame and we wiped the floor with their band. CDB: He's left us, and while we can't say it comes as a major surprise, given his recent health issues (or even the fact that he had two quadruple bypass operations), it does not lessen the sadness that comes with the knowledge that we have lost Bo Schembechler, who passed away in Southfield today at the age of 77. It seems kind of silly, sometimes, when you hear people say things like "I feel like we have lost a member of the family" when talking about people they aren't related to, but in this case, I do truly feel like we've lost a member of the family, for we have lost the spiritual father of the Michigan football family, and for many Michigan faithful, that means we've lost something akin to losing the winged helmet or the color maize. Bo's influence upon the program is second only to Fielding Yost, and Yost wins out only by virtue of the fact that he was here first. Bo saved Michigan football in many ways. He brought a proud program back from mediocrity and made it something to be proud of once more. He made the games with Ohio State into the Ten Year War and he won five of them. He never had a losing season in 27 seasons as a head coach. He's probably not the coach you'd want in a bowl game, but the fact that he lost so many of them in an era before "everybody goes to a bowl" tells you just how good his Michigan teams were in that they were even in a bowl game. He taught the football team the importance of singing "The Victors" by bringing in a professor from the School of Music at the beginning of each year. He gave Michigan 194 wins over just 48 losses and five ties in his 21 years as the boss. He taught us the idea of "Those who stay will be champions." He only lost a total of ten Big Ten games while at Michigan. He gave us Rob Lytle, Rick Leach, Anthony Carter, John Wangler, Butch Woolfolk, Jim Harbaugh, Jumbo Eliott, Mike Gillette, Jamie Morris, Mark Messner, and Tripp Wellborne and countless others. He gave us 13 Big Ten championships, the most of any Michigan coach. He was the believer in "A Michigan Man", leading him to give the keys to Steve Fisher on the eve of the 1989 NCAA Tournament. He was all of these things and more. Are there black marks? Sure, the lack of a National Championship might be seen by some as a black mark, but I disagree. The firing of Ernie Harwell when he was Tigers' president, well, that was a mistake, but that was also when he was well out of his element. Just like when he retired in 1989, it's hard to believe, once again, this time for good. But the memories remain, the traditions remain, the threads that weave him into the tapestry continue to today. After all, who hired Coach Carr in 1980 after stints at Eastern Michigan and Illinois? He's from Bo's tree. Some might say that they could think of no more fitting tribute to Bo than a win tomorrow over tOhio State. That's the obvious answer and would be wonderful. But Bo's legacy transcends a single game, and the tribute will be to keep the spirit of what Bo brought to Michigan in the hearts of Michigan fans. That's the tribute. Thanks to all the nice people who've been linking to us this week, including MGoBlog, The M Zone, and Deadspin. You guys rock. Come see the game that ESPN has called the best rivalry in all of college sports. Since it's Caltech, the misspelling of Univeristy may be a subtle mockery of the academic standards of Ohio State. Or maybe science nerds can't speelcheck." No one leaves at halftime, and when the 'i' is dotted, it becomes emotional for most of the 100,000-plus. Even if you're not a Buckeye, you can't help but admire and respect the tradition. I can get behind that sentiment. Script Ohio is as fine a band tradition as you'll find, and one of the few truly unique ones. Except, Mr. Big Ten Broadcaster, it happens in PRE-GAME. You know, before they kick the football-thingy? In the direct question about which Big Ten band was their favorite, Wisconsin and Ohio State tied for top honors, with Michigan among those also receiving votes. I don't have a problem with OSU's band tied for the top spot in the Big Ten; I have a problem with Wisconsin being the other half of the pair. I've said it before, and I'll say it again: They're overrated. Wisconsin's band is all show with a marginal sound at best, but I guess the tin-eared broadcasters don't notice that. I mean, it's a pretty good show, but there's not a lot of musicianship behind it. When Michigan scores more than 21 points on Ohio State, we're 25-0. One last game for the right to appear in the BCS National Championship game. #1 vs. #2, right here, right now, for the first time ever in this rivalry. Each program undefeated and untied at the end of the season for the third time ever, the first occurence since 1973. It's been endlessly dissected elsewhere and far be it for me not to jump right in. The quick version: Michigan is a bit better at running the football. Ohio State has the advantage in the air. Michigan's run defense is sickening. Ohio State's D just doesn't allow anyone to score. Anyone who predicts a blowout in this game is an idiot. Troy Smith is the key to the Ohio State offense, and he's having a great year. He's completing 66.4% of his passes with 8.6 ypa / 12.9 ypc with only four interceptions, and don't expect that to go up on Saturday. Smith's leading receivers, far and away, have been Ted Ginn, Jr. and Anthony Gonzalez, well-known names around these parts, with a big fall-off in yards to Brian Robiskie and Brian Hartline. Ginn has ridiculous speed, but Morgan Trent did once beat him in a footrace. Last year, Gonzalez lit up the Michigan secondary and I fully support MGoBlog's Hall-Gonzalez/Trent-Ginn coverage scheme. Don't count him as a "possession receiver", but he's the most reliable target when you need the yards for a drive-sustaining first down. Gonzalez makes the medium yardage grabs that Ginn eschews for either the short stuff or long bombs. I haven't seen much of Robiskie, but I saw one touchdown of his where OSU was on MSU's doorstep and he just ran a crossing route through the endzone that torched whoever was covering him for the Spartans. Rory Nicol is a guy with a disproportionate TD/yds ratio; I'd watch for him near the goal line. Michigan's pass defense keys are going to be the guys who aren't Leon Hall. Morgan Trent has been excellent in deep coverage all year, but he hasn't had to guard Ted Ginn. The revolving cast of Harrison, Englemon, Barringer, Mundy, and Adams will need to seriously step it up. It was encouraging last week to see Willis Barringer right in the middle of a lot of pass plays, so I have high hopes for him. Troy Smith has been getting the glory, but the ground game has accounted for 60% of OSU's plays this season. Antonio Pittman has been getting the lion's share of the carries, 214 of the 428 attempts, with Chris Wells accounting for another 97. Between the two of them, they're averaging 4.8 and 5.3 ypc, respectively. Pittman again will get most of the carries on Saturday, especially with Wells's reputation for losing the football. Ohio State's offense is symbiotic. You can't sell out against the run, because Troy Smith is going to torch you. If you commit to stopping the pass, you've opened up room for Pittman & Wells (who really should open up a law firm). Ted Ginn can run you off and keep you safety deep while everyone else gets open underneath. The key to solving the riddle is in Michigan's front seven. They need to stop the run and get to Troy Smith. He will kill you to death and stomp on your face if you give him the time (or a second chance) to throw. Ohio State's receivers are far too talented for us to expect decent coverage for more than four seconds after the snap. And if, by some miracle, his receivers are all covered, Smith can take off and run. In fact, I'd expect to see more designed runs for him against Michigan. Not a ton (David Harris could take his head off), but on 3rd and 4 it might be worth it to take a few chances. But anyway: Giving Troy Smith an extra chance to make something out of a broken play is my nightmare. When we have the chance, we need to put him in the ground. Ohio State's defense has spent much of the year as an undervalued commodity. Replacing 9 starters from last year's exceptional squad, it was assumed that the ofense would have to put up big numbers to make up for defensive lapses. The offense has produced, but most of the time it hasn't really been needed, as the Bucks have only been allowing 7.8 ppg from their opposition. Reading the tea leaves on the Buckeyes' run defense is difficult. They're giving up only a paltry 90.2 yards per game on the ground, but teams have so often found themselves buried by the offense that they're forced to go to the air. Let's try to compare OSU's run defense to Michigan's. Teams have run on Michigan on only 38.2% of plays from scrimmage. Despite often being down a more substantial margin to the Bucks, teams have run on them on 47.6% of the time, so it suggests a little more faith that their run defense can be solved. Michigan's 1.3 ypc allowed looks much better than OSU's 3.3 ypc, but does it stand up? Is it inflated (deflated?) by sack yardage? Let's take out the sack yardage and compare. Michigan has 41 sacks for 320 yards. OSU has 33 for 238. Taking out those rush attempts and the yards they lost, Michigan yields 3.1 ypc and Ohio State 4.3. So there's reason to expect that Michigan's running backs will be able to find some room, even if they don't get any gaping holes, but a Tshimangaesque performance is decidedly unlikely. Mike Hart's been hitting eight-man fronts all year for 4.8 ypc, so I wouldn't expect a massive drop-off in his production. I don't expect OSU to be able to count on Michigan running on 65% of its downs from the get-go, so they should be limited to 7 in the box most of the time. Even with their superior personnel, I don't think you can take Hart out of the game without 8. The key is to keep the game at least close enough that running the ball is a viable option. Penn State's Tony Hunt (who we bottled up on the ground all day) took them for over 120 yds in one of the few games where Ohio State hadn't jumped out to a massive lead by halftime. Anecdotal evidence nurtures the tiny flame of hope here. OSU's pass defense has been turning in a solid performance all year long, and they've posted some gaudy interception numbers (21 for the season). The pass rush has been brutal enough to make 33 sacks. The question here, though, is what they'll do when they see a team with a quality passer with good targets who's been given permission to use his ability. I think Henne will get some room to work with, especially if the defense can keep the score down. The OSU defense has been allowing a 56.9% completion rate, so they aren't impenetrable. Special teams are a net edge for OSU. They put a ton of kickoffs in the endzone for touchbacks, so that can take Breaston out of the picture, while Garrett Rivas doesn't have the leg for us to neutralize Ginn in that way. Punt return yardage yielded and made is a push, but OSU has a slight edge in net punting (37.0 vs. 33.9). Out-kicking the coverage here would be an easy way to die, so Zoltan probably won't be unleashing the hounds. I still have nightmares about previous Ginn returns. For the first time in a while, OSU isn't automatic with their field goal kicking. This may really be the result, however, of the fact that they ask Aaron Pettrey to make a lot more 50-yard attempts than Rivas gets. And, by the way, his long this year is 52 yards. Probably a push here. In the end, these are both terrific, well-matched football teams who richly deserve to be ranked #1 and #2. No one will be able to persuade me that this shouldn't be the real national championship game. It'll come down to execution on both sides of the ball. The defensive line has to keep contain and get pressure on Troy Smith while the coverage holds up downfield. The offensive line needs to give Chad Henne time and Mike Hart room. Henne needs to be accurate and not let that one bad read he seems to make each game turn into a big interception. The receivers need to hang onto the damn ball. The coverage team has to tackle Ted Ginn before the 40. If they jump out to a 14-0 lead, we're dead. It's a huge order to ask of anyone, especially the part about Troy Smith. Michigan has a much smaller margin for error than OSU. Any lapse can turn into 7 points in the blink of an eye, and we've seen those lapses before. Final score: 21-17 and pick 'em. It's 48 hours before kickoff as I write this, and I've put together a collection of my photographs from this season of Michigan football. Stay tuned for more content later today. Tomorrow the football preview goes up. Since GZ has his thing down cold, I need mine, so here it is, the alumni showdown for this week. Attended tOSU, but graduated from Barnard (Columbia's little sister). Fake anthrax victim in 2001, 2002 Pulitzer Prize winner for Explanatory Reporting as a member of the New York Times staff. And then things went a little, well, you know. The longtime President of CBS; he, along with William Paley, is considered the father of television news and was the organizing force behind the first televised Presidential Debate in 1960, when he managed to get Section 315 of the Communications Act of 1934 suspended and put together Vice-President Nixon with Senator Kennedy in the CBS studio in Chicago, which, in part, lead Mayor Daley to get his men out in full force for Senator Kennedy, which may be as simple as campaigning, or as simple as "campaigning." It's important not to confuse this historian with his son, but this Schlesinger wrote the epic work The Age of Jackson, which won the 1946 Pulitzer for History and is still considered one of the better documents of that era. Daniel Okrent was appointed the Public Editor of the New York Times in 2003 and formulated Okrent's Law: ""The pursuit of balance can create imbalance because sometimes something is true." He was also one of the first two people inducted into the Fantasy Sports Hall of Fame since he sort of invented Rotisserie League Baseball with Glen Waggoner (the other first inductee...) From there, everything else is gravy. Advantage: Michigan. I may be a historian by trade, but dude, Okrent invented fantasy baseball! Roy Lichtenstein set about to create art as artificial as possible, and created some very interesting works of art. I'm not a huge fan, but I am not opposed to it either. Former Secretary of Agriculture Dan Glickman took over for Jack Valenti as the head of the MPAA. Richard Lewis is the inventor of the phrase "_______ from hell", and while he did not get into Bartlett's for it, he did get into the new Yale Book of Quotations, which, by the way, I highly recommend, boola boola. Randy and Jason Sklar, funny standup comedians, hosts of ESPN's Cheap Seats (which, by the way, is ending this weekend, which makes me sad) and all around good guys, even if they are Cardinals fans. (No, we are NOT bitter.) I highly recommend the Sklars' CD entitled Poppin the Hood. Advantage: Michigan. Dude, there's two of them. And they brought Chopper 4! Quotation: "My solution to the problem [of North Vietnam] would be to tell them frankly that they've got to draw in their horns and stop their aggression, or we're going to bomb them back into the Stone Age. And we would shove them back into the Stone Age with Air power or Naval power—not with ground forces." Quotation: "The major deterrent to war is in a man's mind." Advantage: Push. During a time of heightened international tensions, well, you start thinking in very harsh terms. There's a lot of good on both sides and far be it from us to claim that one man's service to his country is greater than another man's..
Roy Plunkett invented Teflon. Even if you do nothing else in your life, that's a pretty good life's work. That's all I have for today. GZ should be around with a real preview, you know, actual football content, sometime soon. When I looked back on last year's blog entries on the Michigan season, I completely forgot, somehow, that I was actually EXCITED for the Michigan/Ohio State game last year. Because I had a five stage plan that was going to complete the Michigan comeback, and beating tOSU was phase 4. So the question is why, and the answer is simple, it's how the Michigan/Ohio State game ended. (For those of you wondering why I would go back and rehash this now, it's the principle of not forgetting where this season came from. One minute and nine seconds later, Ohio State whipped up the field, using just five plays to go 67 yards, culminating with a Santonio Holmes touchdown. An extra point makes it 21-19. Now, here's the thing. Michigan took the ball back and Steve Breaston took the ball back all the way to the Michigan 48. All Michigan needs to do is drive the ball to the tOSU 25 and let Rivas have a crack at a field goal that will put you up 24-19, forcing tOSU to drive the length of the field with less than three minutes left. But no, Michigan chose to punt, putting tOSU back in their own 12 and letting Troy Smith go to work. Mike Hart: 9 rushes for 15 yards, a long of 4 yards. Starting on their own 12 with 4:18 left, Troy Smith used 12 plays to go 88 yards for the go-ahead score which would have tried to make it 27-21, but instead made it 25-21. That was it, that was the ballgame. Michigan fell to 7-4, a trip to the Alamo Bowl, and the beginning of the rebirth. It's a different year, it's a different team, it's a different feeling. Am I saying Michigan will win because they have a healthy Mike Hart? No, but it certainly doesn't hurt their chances. The simple thing that people must remember is that half of defense is offense, and last year, that is a big part of where Michigan failed. Perhaps part of the reason I am so opposed to "Christmas creep" is that to me, November is about two things: Thanksgiving and Michigan/Ohio State. After all, it's like Sunni/Shi'ia in this affair. 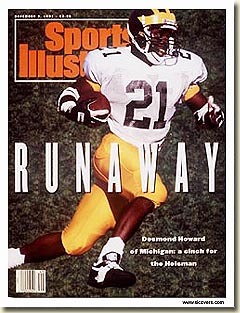 Desmond Howard, strike a pose. It was Michigan's second year without Bo, and as a young Michigan fan, I didn't know exactly what that meant. I was in eighth grade, and I don't have many fond memories of middle school, except this one. Earlier in the year, Desmond had made "that catch" against Notre Dame and had become the "Runaway" favorite for the Heisman Trophy, but some kind of capper seemed only fitting. He took the ball on his own seven, blasted by two Buckeyes and then just took off. I mean, he flew, amazing speed, and just outruns everyone for his 23rd touchdown of the year, his second on a return. But that's not why everyone remembers it. It's because as he crossed the goal line, Keith Jackson just says simply "Goodbye (long pause) Hello Heisman" and as he does, Desmond strikes the pose, a picture that is as iconic as anything you can think of with Michigan fans. In a game Michigan would win 31-3, it wasn't a game breaker, but it was a heartbreaker for OSU. It was two days after Thanksgiving and due to work schedules, we were celebrating Turkey Day on that Saturday at my grandparents' house in Livonia. I made sure that I could watch it, my first Michigan game as an accepted freshman at Michigan. The odds were long. Michigan was the #18 team in the country, Ohio State was #2. I remember one thing and then YouTube prompted the other one. It just seemed like everytime Michigan had the ball, Tshimanga "Tim" Biakabutuka was scoring a touchdown. He would end the day with 313 yards on the ground and plenty of scores. If you didn't know how to spell his name before that day, you would certainly know later. What I had forgotten was, despite being victimized twice by Terry Glenn in the first half, Charles Woodson had a pair of picks (one, two) of Bobby Hoying to help seal the deal for the Maize and Blue in a 31-23 win. Lloyd's second season, my freshman year. I don't have a lot of specific memories of this game because I was attempting to sneak views of it during the very first NAQT Sectional tournament, which was being held at Michigan. What I do remember is being in the auditorium of one of the Engineering buildings on North Campus and one of the players from, I want to say Bowling Green, called a time out in the middle of his match because we were watching the game in the back of the room where his match was being played to see the final last grasp for the then #2-Buckeyes in a 13-9 win for the once again low-ranked Wolverines in Columbus. I also remember one of the players on the opposing team being very very upset about this, but that isn't as clear in my mind. Your highlight from this is the hook-up between Brian Griese and Tai Streets to make it a 9-7 game at the start of the third quarter. Ahh Columbus, fair game for the mocking of Aaron Sorkin. We knew it was magic. 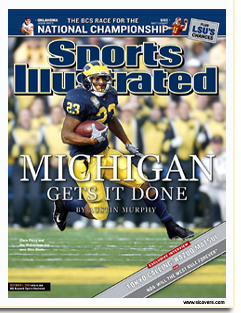 We had had the "leaping interception" by Charles Woodson against Michigan State (yes, this mention is solely an excuse to link to that clip, which is still one of the most amazing football plays I have ever seen in my life.) We had the rally against the Hawkeyes, and now, here it was #1 Michigan vs. #4 Ohio State. After two straight years of ruining the Buckeyes' perfect seasons, would it be tOSU's turn to flip the script? Not so much. I remember it being particularly cold and that they had to scrape a layer of slush-ice off the Michigan Stadium turf before the game (which you can see off to the side if you look closely in the video clips.) I was with Dave in Section 27, Row 53, Seat 17 and we were surrounded by a rogue's gallery of people we'd never seen before. The controversy all week on campus was "Would we rush the field if we won?" The higher-ups made it very clear that this practice was to be verboten and that "trespassers" would be dealt with appropriately. Thankfully, my two of my three major memories of the game's action are preserved in YouTube clips. 1). Charles Woodson's touchdown saving interception in the end zone to preserve the 13-0 lead. As the game ended, students poured on to the field, and, if you have ever been to the Big House, you know that is no easy feat. The earliest transgressors were hit with pepper spray, which wafted up into the stands and began burning the eyes of even those of us who remained in our seats. But it didn't matter. We were headed to Pasadena, one last hurdle to clear, and we were reminded that, as always, it's great to be a Michigan Wolverine. Michigan gets it done. What more needed to be said? I left off last year's game because I have some very specific memories which I will discuss in a post later this week. With a couple of other friends of ours, your correspondents here at the Hoover Street Rag were foolish intrepid enough to attempt the Indiana road trip this year, so this is the eyewitness account from Memorial Stadium. On the drive down to Bloomington, I saw at least four other cars that were obviously Michigan fans going down to Bloomington and didn't see any obvious Hoosiers. I pulled into the lot north of Memorial Stadium at about 12:40 or so and parked in a sea of maize and blue. I guess Hoosiers don't tailgate. The lot, by the way, was only about 15% full with fewer than three hours left before kickoff. On the west side, Memorial Stadium is protected by a pair of WWII-era anti-aircraft batteries. Indiana's campus is gigantic when compared to our Central Campus. I had plenty of time to kill, so I went wandering in the hope of finding something to eat. Half an hour later, I found a strip mall with a pizza joint (closed), a bar (closed), and a restaurant (closed). On the plus side, I walked around campus for over an hour in full Michigan gear without being harassed by anyone, and the campus itself is beautiful. The buildings are all made of the local limestone and they're architecturally coordinated. The alumni association tailgate really is a good thing to find when you don't know the area. The game itself was just shy of being everything a Wolverine fan could ask for. The defense allowed two drives worthy of being called such, and only let the Hoosiers get three points out of them. Michigan got up early and set the cruise control after Steve Breaston finished his 83-yard punt return in the north endzone. Several times in the second half, I declared, "I love boring football!" to anyone who would listen. I expect so much out of the defense these days that I got upset every time Kellen Lewis made a play with his feet, despite the fact that he finished with 37 positive rushing yards...and 32 negative ones. Almost every time Lewis escaped from a sack, he found all of his receivers covered downfield and a Wolverine coming up to put him down. Allowing only 131 yards to an offense as potent as Indiana's is a bigger deal than it sounds. Learned his refereeing "on the ghetto." In other news, Morgan Trent was again called for a ridiculous, weak pass interference penalty on a ball that would've been uncatchable anyway. The ref who flagged him, oddly enough, looked a lot like Stanley from The Office. Special teams were good enough. Indiana seemed to take the ball out to the 30 every time and got one out closer to the 45, but we contained them. Getting into a field position game with Ohio State makes me uneasy, but it's not as scary as the Ted Ginn-shaped beast in my nightmares. Rivas had his random flake-out miss on the extra point (which doinked off both goalposts, it looked like), so now he doesn't have to do that in the OSU game. The offense just rolled. It was 14-0 before Indiana had a chance to wake up and get their only points of the day. Michigan continued to grind through their line all day long, spreading 43 attempts between six tailbacks and getting 202 yards out of them. They pulled out one long throw of the day and Steve Breaston hauled it in. Henne only had 16 attempts on the day, so you can't draw much of anything from the pass game. That was the sort of rock-solid performance I like seeing from the team before going into a big game. And this is the biggest game any of them have ever played in, the biggest game in this rivalry since the mid-'70's, and the only time they've met as #1 vs. #2. I should write myself a reminder to breathe. Michigan has more than twice as many shutout victories (16) over Indiana as the Hoosiers have regular wins over the Wolverines (7). Michigan won the first five meetings in the series by a combined 219-0. Indiana has been a member of the Western/Big Ten Conference since 1899, but Michigan and IU did not play each other during the period of 1904-1924. Michigan didn't play in the conference for eight of those years, but it's still odd. The Wolverines also didn't travel to Bloomington for the first time until 1932, when Harry Kipke's national championship squad beat the Hoosiers 7-0 in front of 10,440 fans. During the entire 8-0 season, the team only gave up 13 total points. The Hoosiers have had a wildly up-and-down season so far. They've beaten Iowa and blown out Michigan State, but they've also lost to 1-AA Southern Illinois and been absolutely destroyed by Minnesota. Head coach Terry Hoeppner started out the season battling a brain tumor and underwent his second surgery, and we here hope he beats this thing, finally. It was really moving to see how happy and proud he was when his team beat the Hawkeyes. Against common opponents, the Hoosiers are 3-3, with wins against Ball State (24-23), Iowa (31-28), and Michigan State (46-21), and losses to Wisconsin (52-17), Ohio State (44-3), and Minnesota (63-26). Boding well for Michigan is the fact that the three teams with the best rushing attacks were the ones that came away with blowout victories. Ball State's run game is practically non-existent, Iowa was without Albert Young, and the Spartans had already lost Javon Ringer before heading to Bloomington. The stats show that the Hoosiers are giving up 171 ypg / 4.6 ypc on the ground. That's competitive with Ball State's numbers before last week. However, the Hoosiers have played some superior running teams, so I wouldn't expect 350 yards again. But it looks like Mike Hart will be able to find some room to run. The defense has also only been able to get 11 sacks, so their line might not be very good. By comparison, LaMarr Woodley alone has 11 sacks for Michigan. In the air, Indiana gives up 231 ypg / 8.6 ypa / 13.9 ypc. These numbers are probably soft, just like Michigan's own pass defense numbers, but for different reasons. Indiana's opponents have been running 69% of their plays on the ground, so they just haven't felt the need to go to the air. Michigan's opponents have been ground into tiny bits on the turf, so they've had to pass for their lives. Michigan gives up 211 ypg in the air, but on 51.5% completions. Indiana's opponents are at 61.5%. The offense is a different story. Quarterback Kellen Lewis, like Antwaan Randle-El before him, is the focus of both the rushing and passing attacks. He leads the team in yards gained on the ground, with 333 on 103 attempts and 4 TD. Tailback Marcus Thigpen is close behind him with 325 yards, but on only 82 attempts (4.0 ypc vs. Lewis's 3.2). Josiah Sears has a good-looking 6.0 ypc on 38 attempts, with a long of 25 yds, and 4 TDs. As a team, they're passing the ball 227 ypg / 6.4 ypa / 11.9 ypc, with Lewis throwing a 55-yard pass as his longest. The 15 TD/11 INT ratio looks pretty bad until you realize that 2 TD/5 INT are from backup Blake Powers. James Hardy is one to watch out for on the receiving end. He's another freakishly tall wideout like they grow in Minnesota and pretty much the only non-RB they throw to in the endzone. The yardage fall-off behind him is marginal, but the TD production is huge: The six receivers behind him with over 100 yards combine for only 4 TDs. Special teams have been a net strength for Indiana. Kicking, they're average. Receiving, they're excellent. Marcus Thigpen has been having an excellent year returning kickoffs, taking it to the house a full three times and averaging 32.7 yards per return. On punt returns, cornerback Tracy Porter has his own return for a touchdown, although he's only fielded 7 returns. Taking out the outlier, he's still getting a quality 13.1 yards per return. He missed a lot of time this year, and he was out against Minnesota. His replacement, Lance Bennett, is very good at taking a knee. When they actually have to kick the ball, the Hoosiers have some issues. Austin Starr has put 4 out of bounds this year. His 10 touchbacks are comparable to Michigan's kickers, but they've only put 1 OB. The coverage has at least been adequate. Starr also handles the field goal duties, where he's 9 for 11 on the season. They don't ask for much range from him: He made his one 46-yard try, but everything else has been 35 yards or less. On those, he's 8 for 10. Punter Tyson Beattie's numbers are comparable to Zoltan Mesko. He's averaging 40.4 net with a long of 71, so that's happening. One additional stat I saw was that they were virtually at par with their opponents when it came to time of possession, despite the gulf in rushing yardage (112.5 ypg vs. 171 ypg). This leads me to believe that the Hoosiers are vulnerable to the big play and, if they don't get a kick-return TD, need to string a drive together to get their own scores. This should be a good matchup for Michigan's defense. Give them enough chances, and they've been pretty good about stopping drives. In the last four games, no one's scored a TD on them without a big play. This is a team Michigan should beat handily. We match up strength-on-weakness in a lot of places with them. We have one great cornerback, they have one great receiver. We run the ball all the time, they have trouble stopping it. Actually, this is probably the best news, since our gameplan was undoubtedly going to be run, run, run, run anyway. We'll also see if we're still able to crush a mobile, running quarterback. We did it at the beginning of the season versus Vanderbilt; let's see it we can get it done one more time. The advantage they have on us is the return game, so this should be a tune up for Ted Ginn. We need to avoid giving them the cheap touchdown, but we haven't let anyone by us yet. I want to say 35-10 Michigan would be reasonable, but I'm sure they'll make it closer for no good reason. 28-14, good guys. I was hanging around our tailgate on Saturday afternoon, discussing the essential off-ness of the football game, when it came up that a friend of my dad's had an extra ticket to that evening's hockey game against Michigan State. I didn't know what to expect: the team voted #1 in the CCHA preseason poll or the one that lost to hockey power Northeastern in our own building and the one that had given up 7 goals the previous evening to the Spartans. Things started quickly. Porter and Hensick jumped on a turnover in the neutral zone and turned it into a 2-on-1. Porter flipped it to Hensick, leaving Lerg with little chance and putting Michigan up 1-0 only 0:17 in. I've seen an early Wolverine goal turn into a 2-1 loss, so I was disappointed later in the period when we failed to capitalize on a 5-on-3 power play we held for a full 1:41. My wariness seemed to be justified when Billy Sauer allowed an almost comical wrap-around goal to even the score. But it turned out to be a momentary lapse. Michigan continued to carry the play for most of the period, getting quality opportunities in the Spartan zone. Finally, with 1:39 left to play, Hensick returned Porter's favor from earlier, passing from behind the goal for Porter to flip it in and put Michigan up 2-1 going into the second. Life in the second period was initially difficult. The Spartans were playing much more aggressively, spending a lot more time in Michigan's zone, and then Chris Summers took a crosschecking penalty. After fighting through the penalty kill for about a minute, Tim Miller knocked the puck away from a Spartan and it took it down for the short-handed goal. However, the Spartan powerplay wasn't over, and things got worse when Jack Johnson was called for roughing (contact to the head) with 30 seconds left in the Summers penalty, and still worse when Jason Dest was whistled for crosschecking. Rather than continuing to play actual defense on the delayed penalty, Dest just looked at the ceiling in frustration while Tim Kennedy skated around him and beat Billy Sauer for his second goal of the night. The second goal was a wake-up call for the Wolverines. They clamped down for the remainder of the MSU power play and started turning the tide, carrying the play back into the Spartan zone and getting better opportunities. It paid off, and in just over 5:00 of clock time the Wolverines turned the game into a rout, burning Lerg for three goals to make it 6-2 at the end of the second. That's how the third period finished up, too. Lerg was replaced for the entire frame by backup sieve Bobby Jarosz, who stopped all 8 shots he faced. Sauer finished it out for the Wolverines and made some nice, quality saves as MSU turned up the heat on him. GDZ: I don't know what to make of Billy Sauer. Last year I saw him beat an excellent Boston College team and lose to an Alaska (Fairbanks) team that was, to put it mildly, Not Good. The only collegiate team this season he kept under three goals before Saturday was Alabama-Huntsville. This game, he gave up just one quality goal on essentially a 5 on 2 and stopped several rushes, turning aside a total of 34 shots. He also fell asleep on one play, not realizing that the puck had been liberated from behind the goal and allowed the easy wrap-around. From what I've seen, he gives up one baffling goal a game and then is some varying degree of On for everything else. Usually we have the offense to overcome it – ours is not a Win With Defense team – but he hasn't won a single game where we scored fewer than 3 goals, and occasionally you're going to run into someone on the other end having a good night. So: From what you've seen, is Sauer actually getting better? If he isn't Turco, can he at least be Blackburn? Are we going to be able to make some noise in the NCAA Tournament? CDB: Realizing I have only been to one game this season, and 80% of that time was spent hitting the refresh button on my phone, but in that game, Michigan staked itself to a 6-0 lead only to see that they needed all six of those goals to beat UConn at home, which scares me a little. The problem with this Michigan team, as I have seen thus far, is that inconsistency is their watchword, and that worries me. I don't want to rip Sauer, he's not even 20 yet, but he does seem to have lapses of concentration. But, I also think that Michigan's defense is not as rock solid as previous ones. GDZ: Jack Johnson is a bit of a lightning rod. It got a little chippy in the third period, and there was a little extra-curricular throwing down. Somehow Michigan ends up with an extra man in the box, and it looked like Johnson was whistled for Standing Around and Being Jack Johnson. Why don't the refs like him? Is he the 'Sheed of the CCHA? Also note this: Johnson didn't play on Friday and Michigan lost 7-4 at Munn. Johnson comes back, Michigan takes the Sparties behind the woodshed at Yost, 6-2. CDB: He's a lightning rod, that is for sure. Some of it is of his own making (see last year's World Juniors), but I do think some of this also is that he is considered to be one of the best prospects, he's well known, he's tall, and he seems to end up around the middle of things. So, I'm not sure. I also don't know that Jack Johnson is worth a seven goal turn-around, I think he's a part of that, but I also think Yost is worth something, especially about Michigan State. GDZ: Last year, I thought Andrew Cogliano was the new Milan Gajic, right down to the #9 on his uniform. He was wicked talented with the puck, but he loved making that one extra move that either resulted in a spectacular shot or (more often) resulted in another opportunity for the defender to take the puck away or him coming up too close to the goalie without a shot to take. I'm no expert, but he looked a lot better on Friday. He looked fast and, on his goal in the second, he made one move and went right in. Is he going to be the new Jeff Tambellini instead? CDB: I'm not ready to make him the Tiger II, but I think we're seeing the usual growth and progression of a player, an potentially exceptional player, between his freshman and sophomore years. The level of competition jumped up and I think maybe #9 has figured out that things he could get away with on pure talent in year's before now require more skill and less finesse. Is it better hockey smarts, or is it better hockey wisdom? I'm not sure, but when you're filling the #9 sweater, you have some very large shoes to fill, Milan Gijac excepted. GDZ: How long before Red Berenson decides he's done? CDB: Firstly, let me take a moment to congratulate Red on winning the Lester Patrick Award for outstanding service to hockey in the United States. Red's been at Michigan as head coach for 23 seasons now, and during that time, he's won two out of every three games (seriously, his winning percentage was .666 coming into the year) since he came back to Michigan. But that isn't your question. I think Red will decide he's done when he's done, but he's 66 years old and I think he wants to be in a position to ease the transition from him to his chosen successor. I do know this, Red looks older this season than he has in the past few (though that's about the hair), but by the same token, if hockey is what you truly love and you still feel up to the grind, why not keep doing it. (By the way, Red's only 6 years older than Lloyd, but because of Bobby Bowden and JoePa and the fact that Bo's still with us, though not on the field, Lloyd doesn't feel like he's "old". I'd be curious what the odds would be on the prop bet of "Lloyd retires before Red." Though I know only what I read and nothing more on this situation, I might still take that bet. One quick question for you: Is this the year Michigan finally wins the GLI again, since the drought has been on since "the run". GDZ: This would be the year to take a run at it. At this point in the season, Harvard and Michigan Tech are both out of the ranked teams, and we've proven we can beat Sparty. A lot will depend on who loses what players to World Juniors, something that's hit Michigan pretty hard in recent years. Since GZ actually has historical data to work with this week, I am handling the best of five(ish) alumni match-up for the Indiana game. (He has some detractors of recent vintage (as do most historical figures), but GZ will point to the fact that he was America's first aviation journalist, and I will point to the fact that with one column, he successfully lobbied for the concept of "fight pay" (for Army troops in a combat zone), a fact reflected in the notion that they dubbed it the "Ernie Pyle bill"
You know, I understand that FDR looked pretty unbeatable in 1940, even if he was breaking America's long-term two-term precedent. But as the GOP headed into Philadelphia in 1940, the three leading candidates had weak support and allowed Willkie, a former Democrat without any political experience, to snag the nomination. If you've ever heard the whole opening of "God Bless America", when Kate sings about "While the storm clouds gather, far across the sea", well, that's pretty much what sunk the Willkie campaign. We should credit Willkie for his bi-partisan spirit of cooperation with FDR throughout the early stages of America's involvement in World War II. Thomas Dewey, former gangbuster prosecutor, a governor of New York, and the so-called "little man on the wedding cake". Namesake of the award for the finest prosecutor in each of the five boroughs of New York. Speaker of the obvious platitude during the 1948 campaign, and victim of one of the greatest comebacks in American political history. Advantage: Michigan. At least Dewey has an infamous pop culture moment in the sun, no matter how fleeting the victory. Margaret Bourke-White was the first Western photograph allowed into the Soviet Union. She was the first female photojournalist hired by Henry Luce for Time and Life and the first female photojournalist allowed into a combat zone. Tavis Smiley has done a great deal of reporting himself, first with BET Tonight, then with NPR, and now with PBS. He is also the youngest African-American to have a professional school and center named after him on a college or university campus when the The Tavis Smiley School of Communications and The Tavis Smiley Center for Professional Media Studies opened at Texas Southern. Advantage: Indiana. Bourke-White college hopped a lot, and though the photograph shown above is pretty damn cool, I like Tavis. He does a very good job of reporting hard news and is an underrated interviewer. Mark Cuban. Internet Billionaire, in part, as he admits, because he knows exactly when to get out. Took the billions of dollars he made from selling Broadcast.com to Yahoo! (a company he co-developed, in part, to allow him to listen to Indiana basketball games in Dallas) and bought his own NBA franchise, the Dallas Mavericks. Turned the Mavericks from perennial laughingstock into perennial contender. Also managed to rack up $1,665,000 in fines from the NBA, in large part because he speaks his mind (or because he's completely crazy...we leave it to the reader to decide). For all of the sound and fury, has zero NBA titles to his credit. William Davidson, "Mr. D",the chairman of Guardian Industries Corp., one of the world's largest manufacturers of architectural and automotive glass. Owner of the Detroit Pistons, the Tampa Bay Lightning, oh and financed the building of the Palace of Auburn Hills, one of America's finest arenas. Has three NBA titles, two WNBA titles, and a Stanley Cup. Oh, and still rocks the Members Only jacket (see above). Advantage: Michigan. It's very close. I like Mark Cuban, in part because he is basically what happened if a fan had a billion dollars and bought the team he loved, BUT didn't run the team like a fantasy team. That said, Mr. D has three NBA titles and once apparently smacked down Mark Cuban at an NBA owner's meeting. He's like your grandfather, but feisty. The man that gave pop culture the phrase "drinking the Kool Aid" (thought it should be noted it was the cheaper, inferior Flavor Aid) and successfully lobbied for suicide prevention barriers to be installed on the Golden Gate Bridge (oh, the irony) vs. a man better known by his FBI title and his manifesto. Advantage: Push. There are no winners here. OK, technically speaking, Mr. Wales did not earn his Ph.D. from Indiana, he took finance classes but did not complete his dissertation. I can't be completely sure that's accurate though, as I have taken several of these facts from Wikipedia. Mr. Page earned his BS from Michigan in Engineering and went on to Stanford, where he would meet Sergey Brin and give birth to a search engine so ubiquitous in its ability to search, that M-W and OED are considering making the word an entry. Advantage: Michigan. Far be it from me to diss the wonderful computer scientists that inhabit North Campus. Though Wikipedia is probably my second favorite site on the net, Google is my favorite, and that can't be ignored. So, it occurred to me that if we're actually a "real blog" now (what with the mention by mgoblog and all), we should probably have some basic ground rules as to what we intend to do here. We're not saying that we're beholden to all of this, as much as we're trying to follow some guiding principles. This list is not final and it is not set in stone. We're just saying, maybe there are some things you should know. But, what better day than Election Day to state that which we stand for? Rule 1: There is to be no discussion of recruiting. This one largely came from me, but GZ, our founder, concurred heartily with me on this. We don't have anything against people who obsessively follow the recruiting hot stove, but in our opinion, there's something a little off about an almost obsessive desire to breakdown the athletic prowess of a high school senior. Besides, there are several other sites that do this much better than we ever could. When a player becomes a Michigan player, we'll talk about him then. This, by the way, may be the one bedrock principle we DO have. Point 2: We have no insider knowledge, nor will we claim to have any. We watch the game, we watch highlights, analysis, read the papers, other blogs, and the like. Think of this as variations on a theme, more than original composition. We're not message board hawks, and it's not like we actually know people. Point 3: We will be too smart for our own good sometimes and too snarky for our own good at others. If you've read this far, you should know that by now. Think of it as part of that "Michigan arrogance" you hear so much about. Point 4: This is not life or death. We love Michigan football (and the band), we'll spend a lot of time thinking about it and discussing it, but if we don't update every day, or every other day, well, we're sorry. We'll do what we can when we can. Point 5: There is a "we" in this blog, but there is also an I or two. If we make reference to we, it's something that we know that we agree upon. If it's "I", check the entry, the other side may not necessarily disagree, we just don't know for sure. I don't entirely know what to make of this game. On the one hand, the offense broke out of its slump (facing a terrible defense) and scored 34 points while running for something like 35000 yards. On the other hand, they spotted Ball State a 9-7 lead. Ball State! Why were we running a stretch play to the right side of the offensive line in our own endzone? On Michigan Replay, it looked like Brian Thompson's block was ineffective and doomed Mike Hart. Then, on the next drive, Henne threw a pick-6 where two Ball State DBs had a better shot at the ball than Henne's intended target. On the whole, though, Henne looked halfway decent, but his receivers were afflicted with dropsy, especially on third down. From what I remember, Butler, Breaston, and Arrington all missed well-thrown third-down conversions. By the way: We still scored 34 points. On defense, it's nearly as confusing. The full first-team defense gave up only 3 points all day on one 47-yard field goal. When it was 31-12 in the third quarter Lloyd sent in an entirely second-string defense. Quickly enough, Johnny Sears was torched and it was 31-19. Then, with some of the starters re-inserted in the defense, Charles Stewart didn't have great coverage and failed to tackle immediately after the catch, leading to a short run into the endzone. On the next drive, the first string was back in, but Ball State still had them back on their heels. They bent all the way down to the 2 before driving them backward. A truly stupid facemask penalty on a third-down sack gave Ball State at least seven downs in a row within the ten, but the defense held firm, allowing Michigan to all but run out the clock on their next possession. So. If we don't do some remarkably stupid things, this game would've ended 34-6 (assuming they would've taken the field goal on 4th and 7), or maybe 34-13 at the worst. The players are saying the right things about this being a wake-up call, and how you can't take anyone lightly. Let's hope they believe what they're saying. Indiana's the most important game on the schedule right now. Finally, to anyone who had a ticket, but didn't show up on Saturday: Why? How many opportunities will you have to see a 9-0 Michigan team? Before Saturday, it was only the third time in my lifetime we've been 9-0-0. Now it's only the second time I've been alive to see a 10-0 squad, so we'll be road-tripping down to Bloomington next Saturday. Missed their pregame. Halftime was average. They played an oddly-arranged Beatles medley. Usually, "Something" will be somewhere in the middle of your show if you're going to play it, not as the "rousing" finale. At least it looked like they practiced a few times. Does anyone remember if they used flip-folders? I forgot to check. Pregame looked good, although I missed everything before the trio to "The Victors" (When I scheduled my dental appointment, this was still the bye week). Halftime was excellent. After three weeks of halftime shows that were more about the band than the audience, the pendulum swung way back to pandering to the crowd with a show of TV themes and formations that made pictures. It was a fun show. Other folks have already noted Mr. Stewart's appearance with the band, so I'll let them cover the details. I have to say, though, Patrick Stewart is a much more talented conductor than Verne Troyer. The band followed his lead and he picked a consistent pace. Mini-Me was allowed to conduct "Let's Go Blue" at one game in 2000, I think. We ignored his flailing and played the correct tempo. This will be first meeting between these two programs, so there aren't even any record books to throw out. This just ruins my Fun With Historical Statistics segment (Shut up! Statistics can be fun!). Instead, our qualified scienticians have compared celebrity alumni in an attempt to discern the outcome of the game. Joyce DeWitt made a name for herself as Janet on Three's Company, but playing Not The Hot One, But That Other Chick quickly wore thin for her as Suzanne Somers was getting all the attention. She later turned her experience into a ridiculous TV movie which missed capitalizing on John Ritter's death by about six months, but made for a hilarious TWoP recap. Ann B. Davis played the slightly sassy live-in housekeeper Alice on The Brady Bunch, making dinner and doling out wisdom. Advantage: Michigan. Wise and no-nonsense, Alice could also keep a man, as shown by her romance with Sam the Butcher. Clear evidence of her superiority is the fact that she has a pop culture tournament named after her. John Schnatter founded Papa John's out of his dad's bar and has grown it to a 3,000-store chain. Tom Monaghan took an Ypsilanti pizza joint from one store to now over 8,000 in 55 countries. Of course, he's had a little longer time to work with it. In 1983, he bought the Detroit Tigers. In 1984, they won the World Series. Since then, he's sold the Tigers and his share in Domino's, and has taken up conservative philanthropy. He's founded the Ave Maria School of Law in Ann Arbor and is now building the town of Ave Maria, Florida as a conservative Catholic city that will house the full Ave Maria University. Advantage: Michigan. Monaghan's strict, orthodox Catholicism motivates a sort of philanthropy and worldview that, frankly, freaks me out. However, he turned $575 and an old Beetle into an enormous corporate empire, not to mention giving Detroit what remains its most recent World Series victory. Jim Davis, a native of Muskegon, started Garfield in 1978 and the fat cat now runs in 2,500 newspapers. During my prime cartoon-watching years, Garfield & Friends was always on, so it's the animated show that I remember most, rather than the comic strip. Cathy first appeared in 1976, runs in about 1,400 papers, and has no nose. Ack. Advantage: Michigan. If you'd asked us just a couple years ago, it would've gone Ball State's way. Somehow, the omnipresent merchandise, the farmed-out strip, and the "humor" weren't enough to put us off the tabby, but the two freakish CGI movies were. Don't get us wrong: Cathy is really annoying. But we're at Lesser of Two Evils here. David Letterman started out as a weatherman in Indianapolis, became a comedian in Los Angeles, got some help from Johnny Carson, and became the best late-night talk-show host on the air. He also got really mad once when a paper described him as a "non-voting Republican" (it was the non-voting part that ticked him off). Ann Coulter is a right-wing author/talking head and a self-described "polemicist". She got her start in the national eye with appearances on MSNBC, parlaying that into a slew of New York Times best-sellers, such as Godless, Slander, and Treason. Allegations have surfaced that she might have recently voted in the wrong precinct where she lives (in Florida! ), which would be a felony. Advantage: Ball State. Is it too obvious that we stacked the deck here? Ann Coulter is a shrill, right-wing harpy. If she actually believes even half of what she says, God help us all. She adds nothing to the national discourse and is, in fact, rather boring, since her points are so easy to dismiss. Letterman is way better than Leno and his only real rival in the late-night arena is Conan O'Brien. "Will It Float?" is America's favorite game show, and we have a weakness for game shows. Brian Collins was filling in on a Ball State sports broadcast one day. It was terrible, it was awful, and his catchprase "Boom goes the dynamite!" would make him an internet celebrity. Rich Eisen worked his way up to become an ESPN SportsCenter anchor opposite Stuart Scott before leaving to host NFL Total Access on the NFL Network and doing US Open tennis coverage for CBS. Advantage: Michigan. Internet celebrity is so fleeting. And while you can only go to the well so often with VH1's I Love the --'s, Eisen came out of it looking pretty good. Plus he spent a significant amount of time at the same desk without trying to kill Stuart Scott, which says a lot about his self-control. Scientifically-Predicted Outcome: Michigan 28 – 7 Ball State. Ball State is currently 3-6 overall and 3-3 in MAC play, with wins over Eastern Michigan, Buffalo, and Miami of Ohio. The only common opponent between the programs is Central Michigan, who defeated them 18-7 in a slightly wacky game. Yes, Brian Kelley games are always slightly wacky, I know the rule. After the first touchdown of the game, CMU tried a trick play on the PAT where the kicker tried to run for the two-point conversion. This failed. After their next TD, CMU again tried a two-point conversion and failed. Then, after their third TD, the kicker missed the PAT. Thus, 3 TDs --> 18 points. On offense, Ball State managed only 56 yards on the ground. CMU also made a goal-line stand to stuff them on 4th and 1. This suggests Michigan shouldn't have to really worry about keeping their rushing stats down. In the air, the Fightin' Football Cardinals managed 160 yards, but they were fighting a 20-25 mph wind in 45° weather. In all their other games, they've put up at least 20 points. They hung 27 on Western Michigan (of Garrett Wolfe-stopping fame), so this suggests the passing game is where they make their living, and the stats bear this out. They're only getting about 2.9 ypc/86.1 ypg from various running backs, but 264.7 ypg (8.6 ypa/13.0 ypc) through the air. They kept Central's beast-man Dan Bazuin to only one sack, so their offensive line must have at least some talent in pass protection. And even if Michigan knocks another quarterback out of the game, Ball State has been using two of them all season. Joey Lynch was the starter for five games, Nate Davis for four, and both have played in every game with nearly identical stats, so I don't know what's going on there. The defense is giving up some points. Northern Illinois took them for 40, so they have some rush defense issues. Purdue got them for 38, so they have some pass defense issues. Really, they're a mid-to-lower MAC defense all around. They're giving up an average of 4.7 ypc/160.7 ypg rushing and a gaudy 289.6 ypg passing (8.5 ypa/13.0 ypc). This all leads to the average opponent putting up 28 ppg on them. Michigan should handle this team pretty well, at least as well as Northwestern last week. The forecast is calling for mostly cloudy skies and temperatures in the forties, but it's supposed to at least stay dry, which should improve the offensive performance. Ball State's running game will be shut down and we'll get good enough play from our secondary to keep them from threatening. If we can get up early, Lloyd will let up off the gas pedal on offense so as not to embarrass former Michigan coordinator Brady Hoke. It'll be Senior Day and Lloyd will want to rotate as many guys as possible into the lineup. Carl Tabb sightings may be numerous. I really wouldn't have a problem if Jerome Jackson was our leading running back on the day. Jeff Kastl could get some snaps under center. The score might end up 28-10, with the touchdown coming in garbage time, or it could be 41-3 if we decide to play the whole game.